Tube lineup: 35Z3 Rectifier, 50L6 GT Output, 7B7 I.F. Amp, 7C6 2nd Det/AVC, 7A8 Mixer. This one was purchased at a swap meet in Florence, KY sometime in June of 2002, for a whopping $10. The standard repairs brought it back to life. These repairs include all new capacitors, a new power cord, and a good cleaning. The original finish is in very good condition so it was left alone. The white paint around the base is flaking off though, so one of these day I'll get around to painting it. 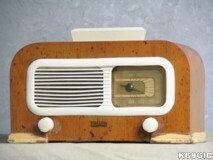 © Copyright 2005 "Jeremy's Antique Radios"